Since I published my post a few months ago showing the exterior of my restored 1920’s chicken coop, I’ve received several comments requesting a look at the interior of my coop. The interior is a bit less charming than the whitewashed exterior, but is functional, clean, and spacious. About half of the upgrades I have done to bring this old chicken coop back into functional use for modern chicken-keeping have involved upgrades to the interior. 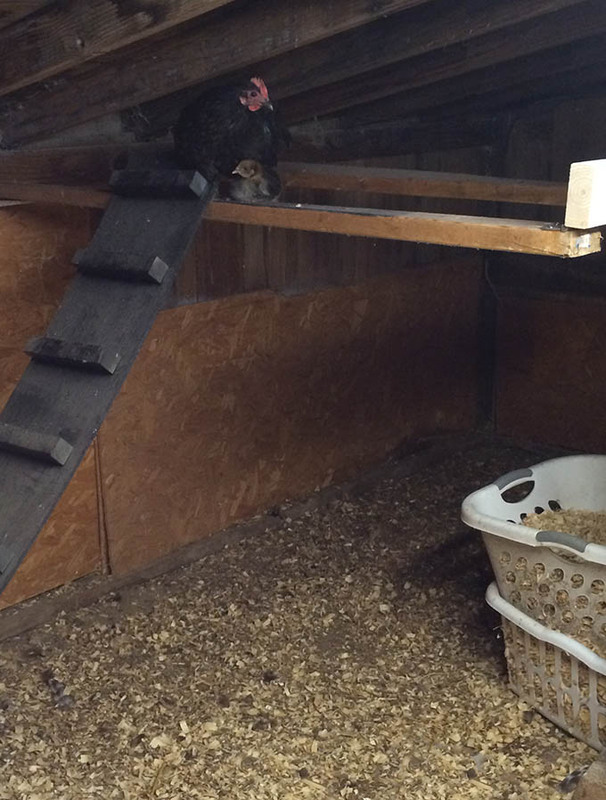 A panorama of the interior of my chicken coop. Click to enlarge. Double Entry Doors: As you can see in the photo above, my coop has two entry doors- one on each side of the building under the highest end of the roof. The panorama is taken while standing at one of the open doors. Double doors allow easier cleanout and maximize air flow in the summer: positioned across from each other, they allow the breeze to flow through the coop improving air quality for my hens. Bank-Barn Style Construction: Traditionally, a bank barn is a barn that’s built into a hill, so a small portion of the barn is underground, and insulated accordingly. While my coop is not a traditional bank barn style- since no part is underground- it shares a similar feature of being built into the contours of a sloped yard. The level foundation ends 2ft off the ground by the end of the run, allowing rain to drain through the soil of the chicken run rapidly. Elevated Floor: Gravity-Assisted Clean Up: I saved the best for last, guys. As you can see in the photo below, the contours of my sloped yard meant that a foundation flush with the ground on the west side created a 18-24″ rise from ground to coop-floor on the east side. Rather than see this as a problem, the creative original builder added a door and used this as a place to “dock” a wheelbarrow during cleanout. Cleaning out my coop is so easy. All I need to do to clean out bedding is park a wheelbarrow under this west door and use a turf rake to push soiled bedding into the waiting wheelbarrow. The turf rake is like a push-broom with stiff plastic tines that clean the floor really well without getting stuck on bumps and ridges like a shovel would. No scooping. No lifting. For this, I could kiss the person who designed my old coop! 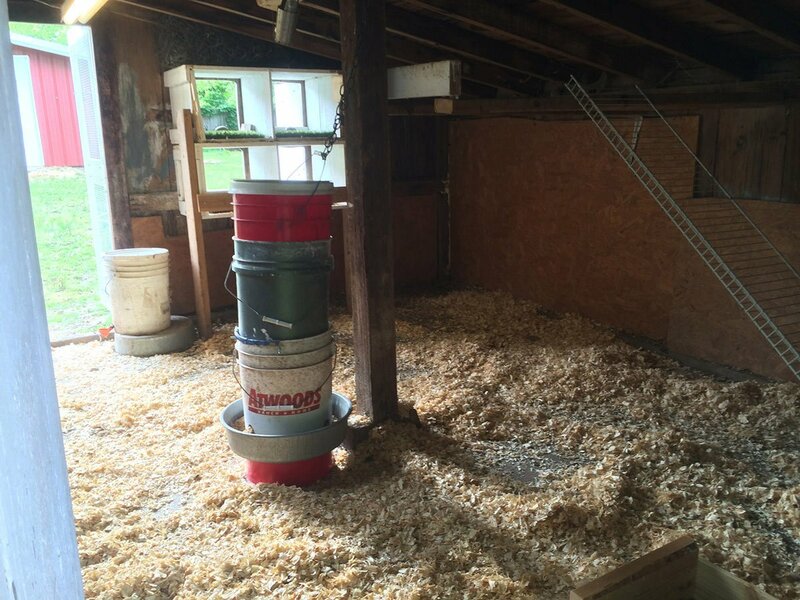 A poured cement floor makes the coop easy to clean and never muddy. These nesting boxes were constructed from used shipping crates salvaged from the dump. 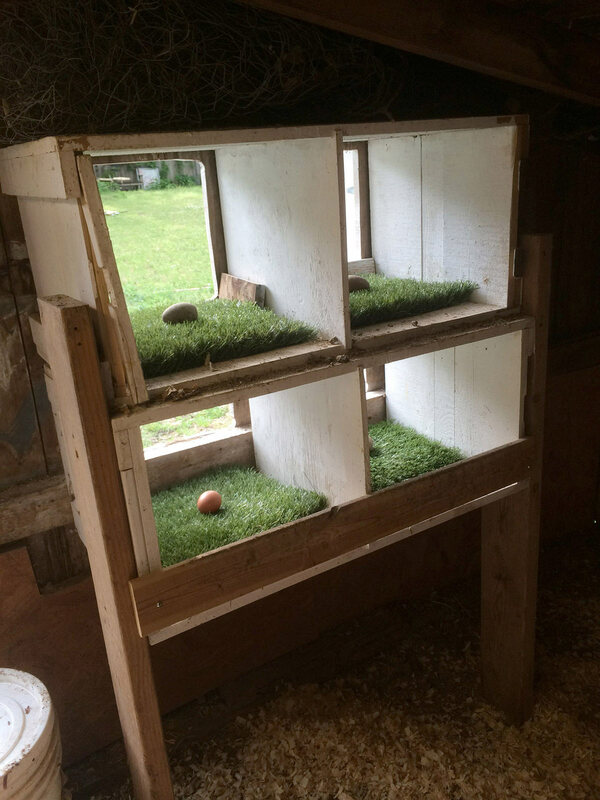 Nesting boxes are lined with astroturf for easy cleaning. 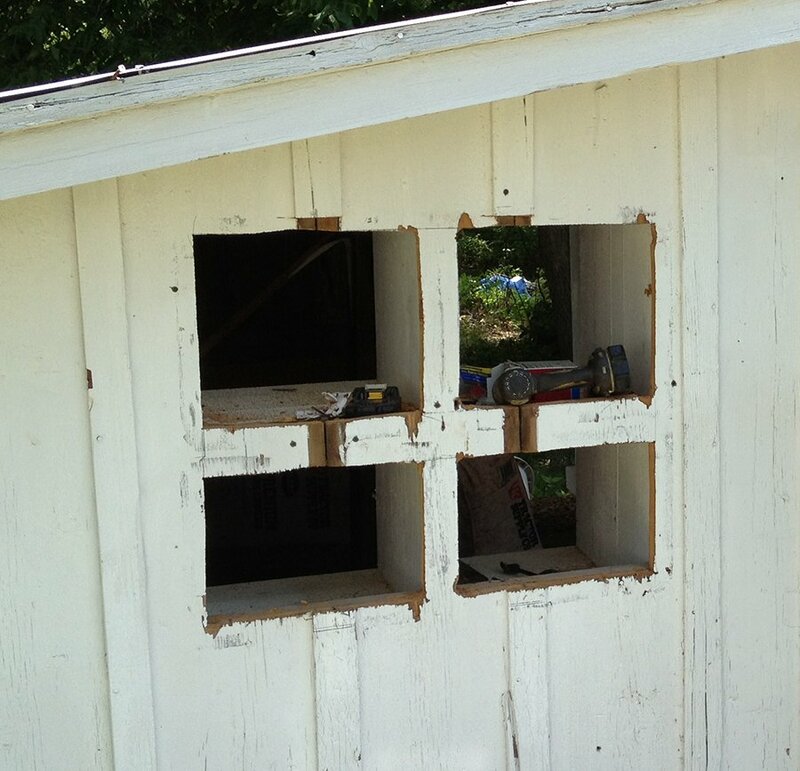 Scrap plywood provides insulation and strength to the exterior siding. 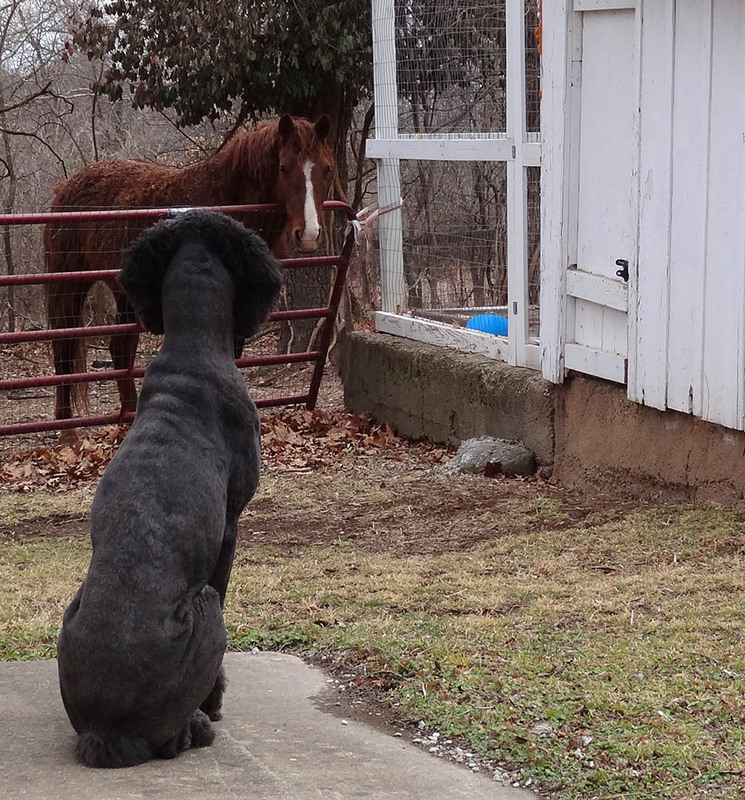 My DIY 2-week chicken feeder is visible in the foreground. 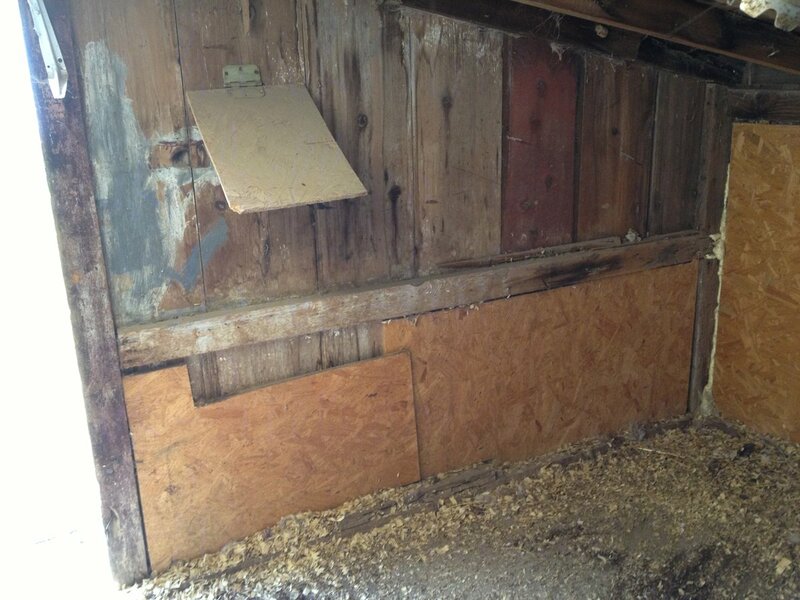 BEFORE: When I purchased the property, using scrap plywood to insulate walls was the first order of business, but I was itching for nesting boxes. AFTER: My father picked up partitioned wood shipping crates at a salvage yard, so I was able to create these for nesting boxes for under $20. I removed the bottoms from the crates, turned them onto their side and stacked two crates, then mounted them on the wall and cut holes in the exterior wall behind them. The final step was to use my kreg-jig to make a pair of cute doors to secure privacy and predator protection for my hens. 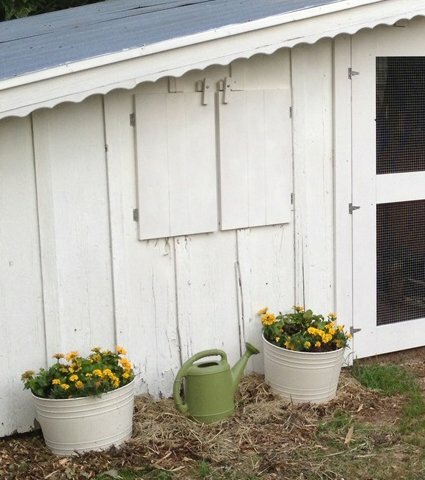 How do you keep greens growing in the chicken run? I’ve never seen anything a chicken won’t try to eat.